Anglo-Dutch Shell, American ExxonMobil and Chevron, French Total and Italian Eni, the world’s biggest multinational oil companies are said to be in danger of losing about $2.3 trillion of investments in the event that global demand for crude oil peaks, a new report by Carbon Tracker referred to by Bloomberg has stated. According to the report, this would happen in the next 10 years as the world works towards limiting global warming. American oil major, ExxonMobil is said to be the most highly exposed by the report as it has as much as 50 percent of potential spending up to the year 2025 on projects that would not be needed as the world changes its energy mix to meet climate targets, the report noted. Released Wednesday in collaboration with the Principles for Responsible Investment, Shell, Chevron, Total and Eni on their part are at risk of wasting as much as 40 percent of expenditure, with British Petroleum (BP) wasting as much as 30 percent, the report stated. A Bloomberg report monitored by Businessamlive noted that while the energy industry is debating the role it will play in the transition to a low-carbon world, investors raising questions about the viability of future spending in the face of attempts to limit global warming. But while Shell says oil demand may peak in the second part of the next decade, BP thinks it could happen in the 2040s. Already, the oil companies are facing some pressure from investors. Last month, Exxon shareholders splitting with the company, urged it to publish a detailed analysis on how carbon curbs could affect the value of its oil fields, refineries and pipelines. And while Shell investors voted against a resolution asking the company to publish targets for reducing greenhouse gas emissions, it continues to face demands to raise investment in renewable energy and cut down on oil and gas, reports Bloomberg. The Carbon Tracker report showed that under a business-as-usual outlook, capital expenditure and production would generate 380 billion tons of carbon dioxide by 2035, noting that oil companies would have to avoid projects generating 60 billion tons of CO2 to be consistent with the International Energy Agency’s scenario that gives the world a 50 percent chance of limiting warming to two degrees Celsius. Exxon, BP and Shell are among majors that have said they support the Paris climate agreement to limit greenhouse-gas emissions, with BP CEO Bob Dudley describing the transition to a low-carbon economy as inevitable, according to Bloomberg. 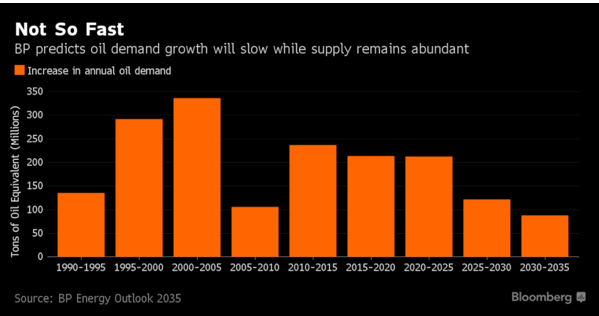 Bloomberg also reports that while peak demand would hurt private companies, it would have a milder impact on Saudi Arabian Oil Co.,which is planning the world’s biggest share sale next year. No more than 10 percent of the explorer’s spending risks going to waste because of its low cost of production.